Here's a reminder that the current Inky Paws Challenge still has five more days! 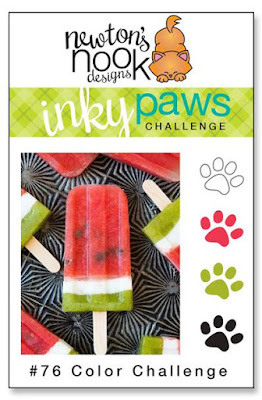 Create a project using the colors--white, bright red, melon green, and black. I cut the frame using the Framework die set. 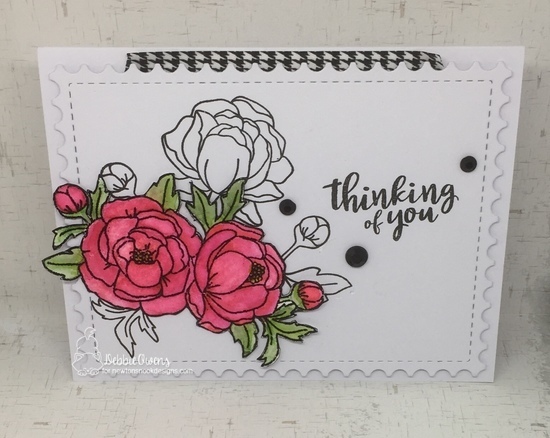 Then I stamped a floral image and sentiment from the Peony Blooms stamp set. I stamped and fussy cut another floral image and colored it. I adhered it to the frame using dimensional tape and adds enamel dots and washi tape to finish it. and join us using these fabulous colors! This is stunning! I love how the black and white flowers are in the background and the pop of color in front! So pretty! This is just plain beautiful Debbie. So elegant. The strip of black herringbone washi tape adds that perfect touch. Lovely design Debbie! The pops of colour against that white and black is really classy!